French President Francois Hollande pins the Legion d’Honneur Grand Officier, the highest medal in France, on Chairman Cho Yang-ho of Hanjin Group at a ceremony on Nov. 4 at Grand Hyatt Hotel in Seoul. French President Francoise Hollande pinned the Grand officier de la Legion d'honneur, the highest French medal, on Chairman Cho Yang-ho of Hanjin Group on Nov. 4 for his achievements to improving Korea-France economic relations. He’s been chairman of the Korea-France High-Level Businessmen’s Club since 2000 and chairman of the Organizing Committee of the 2015-2016 Korea French Mutual Exchange Year. He joined his late father Cho Choong-hoon as the only Koreans who won the coveted French medal. French President Hollande, at a ceremony at Grand Hyatt Hotel in Seoul on Nov. 4, said the medal has been presented to Chairman Cho in appreciation for his great achievements in boosting economic relations between Korea and France. 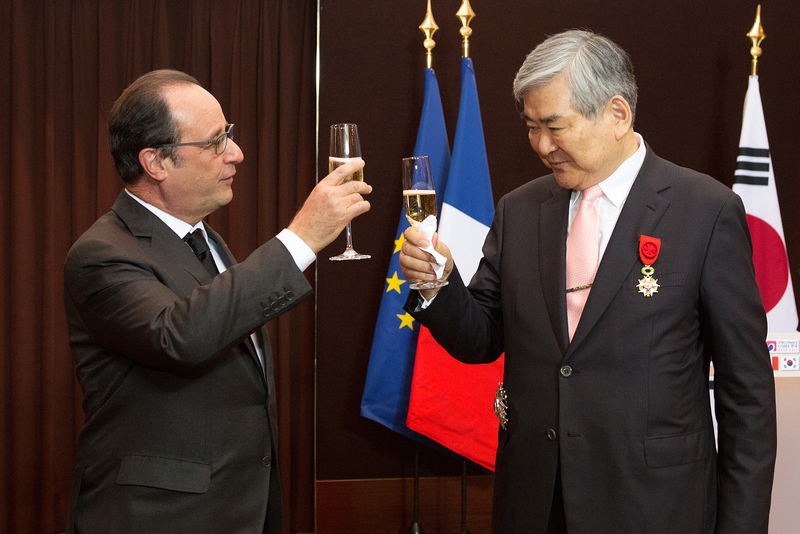 “France is fortunate to have a friend like Chairman Cho,” the French president said in presenting the medal to the chairman of Hanjin Group, which includes Korean Air as one of its affiliates. Chairman Cho has been networking in the private business arena as Chairman of the Korea-French High Level Businessmen’s Club. Further taking up the role of Chairman of France-Korea Year 2015-2016, Chairman Cho actively fosters cooperative ties between the two countries by advancing joint businesses opportunities. Recently, Korean Air celebrated the launch of the Musee d’Orsay’s first-ever Korean-language audio guide, sponsored by the airline. Founded by Napoleon Bonaparte in 1802, the Legion d’Honneur is France’s highest decoration, recognizing achievements in fields including public service, economics and culture. It is divided into five classes of increasing distinction: Chevalier (Knight), Officier (Officer), Commandeur (Commander), Grand Officier (Grand Officer) and Grand Croix (Grand Cross). 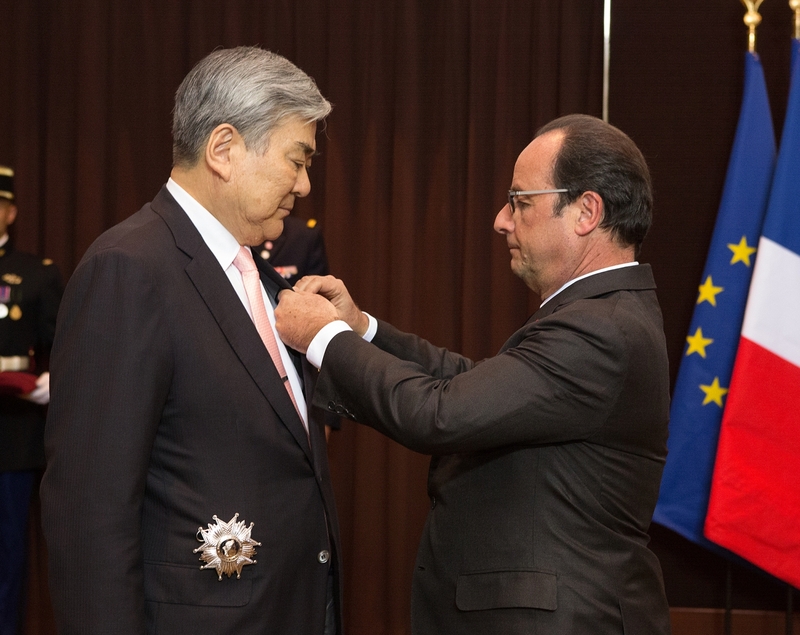 Chairman Cho was awarded the title of “Grand officier de la Legion d'honneur” in 2004 for his contribution to the bilateral cooperation between France and Korea. The honor proves that Chairman Cho is following in the footsteps of his father, the late Chairman Cho Choong-hoon and the founder of Hanjin Group. Prior to Chairman Cho recent award, the late Chairman Cho was the only Korean recipient of Grand Officier.